The third instalment in our fledgling ‘Brazilika' series is a high octane and non-stop Brazilian block party mix from DJ producer and psychedelic rock librarian Andy Votel. 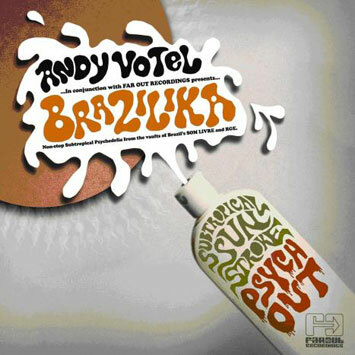 Expertly squeezed, segued and sequenced together, Votel's rapid fire journey ventures into both the fondly remembered Tropicalia period and a period less well known, characterised by obscure acid rock, freak folk and other mutations of Musica Popular Brasileira (MPB). Votel's twisted tale unearths a vast array of weird and wonderful musical stories from the likes of Os Mutantes, Novos Bianos, Sidney Miller, Os Brazoes and Azymuth. All tracks were originally conceived in the same climate that spawned samba rock and tropicalia yet pages away from the scrutiny of the political dictatorships of the 1970s and very different to the catalogues held by the European majors. This definitive compilation is comprised of tracks handpicked by Andy Votel and were all originally released on Brazil's Som Livre and RGE imprints. Under those distorted guitars, the indelible indigenous South American influences heard in the percussion and vocal arrangements give these recordings an individuality exclusive to Brazil. None more so than the fuzz-ridden, re-workings of classic national favourites exemplified by Moraes Moreira's version of 'Se Voce Pensa' previously recorded by both Gal Costa and Roberto Carlos. Also in the mix Os Mutantes in a later incarnation to mark the era when prog rock finally landed in South America. By this time Som Livre's catalogue had began to boast a roster including funk-rock luminaries such as Tim Maia and Azymuth -who can be heard on this mix at their very hardest, oozing with Brazilian funk attitude which reinforces the Far Out connection.